One side of the postcard is generally reserved for the Post Office, while the other usually has some kind of photo or design, along with the names of household members and ages of any kids, and a generic seasonal phrase (“A Happy New Year” is common). Since the average family sends 50-150, it's a lot of work, so personal notes are generally kept very short. As with families preparing Christmas Cards in America, it can be a big deal to get just the right photo to put on the card. 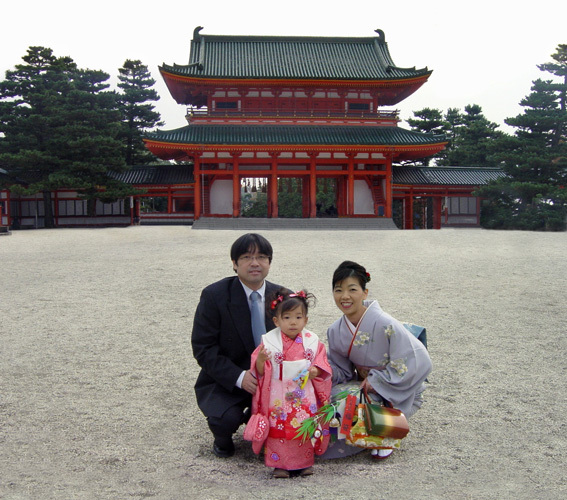 A friend recently took advantage of an occasion on which everyone (including their exquisitely cute two-year-old) got dressed up and visited a shrine, to take some photos that might be appropriate for their New-Year's card. Unfortunately, none of them came out well. There was something wrong with every single shot -- usually someone was blinking, looking the wrong way, had their head cut off, etc. The photo below is one that they generally liked, except that it doesn't reflect the mom's normally-cheery face. With all my Photoshop fun lately, I thought I might be able to help. 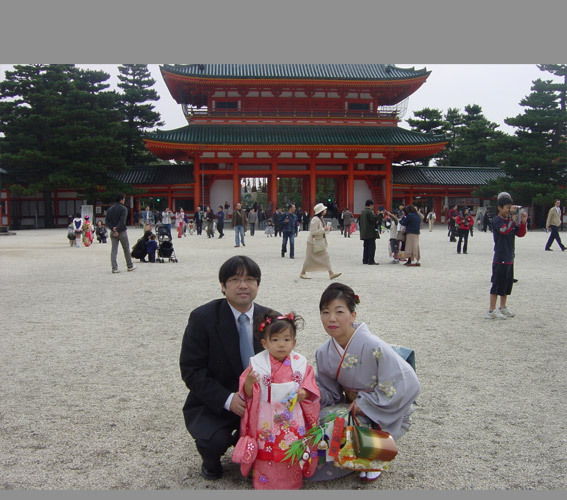 From other photos dropped in a smiling-mom-face, kid's feet, top of the trees, and top of shrine entrance. It all took about five hours (since I'm still pretty new at this), but I'm proud of the results. I especially liked the pasted-on smile. That was great. President Bush could use your help to “find” a few WMD’s in Iraq. Actually, it’s the head that’s pasted on, not the smile alone. I’ve found that it’s generally tough to paste in just a smile, since people’s whole face changes when they smile (especially eyes and eyebrows), and then it’s tough to get the skin tone just right (people really look at the face, so can notice problems easier). In this case, I took a photo of her from a totally different setting, but where she was at the right angle, lifted the head (at the neck) and removed the red/dark background, then dropped it in. The “seam” is in the middle off the neck. Excellent! Must have required patience and a good understanding of Photoshop. I already guessed the people would be the most difficult due to background recovery required and I see you borrowed from the trees. Nice work with before/After effect which makes it fun to compare. What do you use to erase cut-lines developed after a copy & paste?